Locus steampunk issue featuring yours truly and Cherrie Priest – we may, or may not, be the same person. In which everyone’s favorite indomitable vampire wields italics in your general direction. What is to be done about men who wear pleated slacks. Lord A: My darling pumpkin flower, nothing for it, immediate capital punishment. Ooo, snack time for meee! Wants to know how to wear a proper hat in a modern car. Lord A: Darling, invest in a convertible! Lord A, Need ur fab fashion advice. Choosing colors for my wedding. Navy & lavender, what wld u suggest 4 an accent color? Lord A: Gold, my little perwinkle, lots of gold and sparkles! If you have a werewolf problem, silver is also good. Or champagne. Champagne goes with everything. Dear Lord Akeldama, I’m a werewolf dating a ghost. Have problems getting intimate. Suggestions on how to overcome problems? Lord A: Conversation makes for a scintillating start to any evening, and it’s something everyone can enjoy. However, and I hesitate to darken your romance, but I’m afraid you may be doomed by compatibility troubles. After all, you go bone bending one a month, and she’s got no bones left to speak of. Fear of being bitten by vampires (no offense) & werewolves. What weapons do you recommend while still remaining fashionable? Lord A: I have it on good authority that hair sticks make wonderful defensive weapons. I myself enjoy the occasion cravat pin of consequence and appeal. Your best defense, however, is in the company you keep, surround yourself with exquisite objects and dazzlingpeople and any attacker will be instantly distracted! 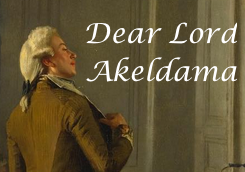 Dear Lord Akeldama, I have lots of guy friends but they keep falling in love with me and when I don’t reciprocate, they bail. What can I do? if Lord Akeldama could share appropriate dance steps to use when celebrating another @gailcarriger addict declaring themselves? Sydney Opera House from the front = Darth Vader?